With one half of the Commercial Resupply Services (CRS) puzzle enjoying a fully successful test flight, Orbital’s Cygnus spacecraft is closing in on its own debut attempt to visit the International Space Station (ISS) later this year. In a mission that is surprisingly similar to that undertaken by SpaceX’s Dragon, the success of Cygnus should result in full CRS capability by 2013. While the mission may be similar, the test schedule is slightly accelerated, with Orbital first tasked with a debut flight of its new launch vehicle, the Antares – formerly known as Taurus II, to be then followed by a one-off full COTS level demonstration mission, not unlike SpaceX’s C2+ mission, tasking Cygnus with a single flight to prove its ability, prior to starting CRS operations proper. Antares’ debut has been delayed, mainly by ongoing work at the Wallops launch site, although it is hoped Orbital will be able to test launch the new vehicle and then follow it up with Cygnus’ mission to the ISS by the end of this year. The launch vehicle is powered off the pad by its main engine, the Aerojet produced AJ-26 – a rebuilt version of Soviet NK-33, originally intended for the massive N-1 launch vehicle. A milestone for this engine was reached last month, when the company achieved a successful test firing at NASA’s Stennis Space Center (SSC). Antares utilizes an ATK solid upper stage called the Castor 30, which is a derivative of the Athena and Taurus I first stage Castor 120 which is in turn a derivative of the Peacekeeper ICBM first stage. 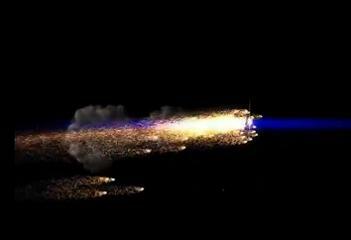 The first two initial flights will use the Castor 30A, while an upgraded version will be utilized for the next two flights called the Castor 30B. 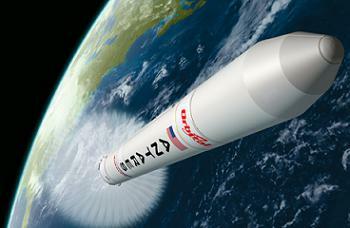 Later in the vehicle’s lifetime, Orbital had originally intended to switch to a liquid upper stage called the HESS, utilizing the Russian RD-0124. 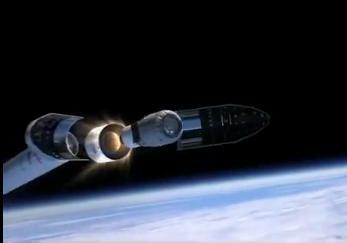 However, the company later decided to go with a stretch of the original upper stage called the Castor 30XL. The Castor 30XL will power the last six flights scheduled right now for the Antares, and will launch extra cargo on a larger Cygnus Spacecraft. The upcoming milestones for Antares include what documentation describes as the 7K hot fire test on the launch pad at Wallops. 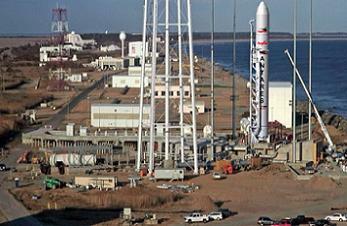 Antares’ testing had placed the hardware into a stance to be ready to conduct this hot fire by the first half of 2012. However, the delays to the schedule, caused by ongoing construction of the new pad by the Mid-Atlantic Regional Spaceport (MARS) teams, caused a slip to this test. The current Orbital schedule shows this test fire will take place in the third quarter of this year, to be followed – within weeks – by the debut launch of Antares, validating the new vehicle ahead of aiding Cygnus’ first trip into space. No official launch date has been published for the COTS demonstration mission to the ISS – a single full up mission, as opposed to the C1 and C2+ mission for SpaceX’s Dragon – although the hope is a successful debut of Antares would allow for a mission in the fourth quarter of this year. 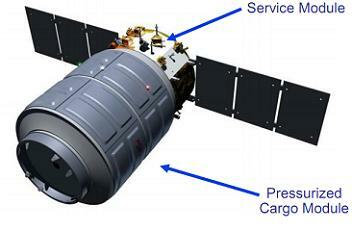 The Cygnus vehicle consists of an advanced Service Module and a Pressurized Cargo Module (PCM). The Service Module incorporates avionics, power and propulsion systems from Orbital’s flight-proven LEOStar and GEOStar satellite product lines. 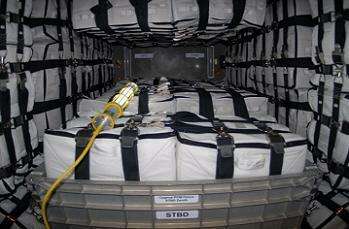 Thales Alenia Space are providing Orbital with the pressurized modules for cargo missions to the ISS. The first PCM was followed by three more units in “standard” configuration, capable of transporting up to 2,000 kg of cargo each, along with five “enhanced” configuration units to follow, boosting payload capacity to 2,700 kg. While Orbital’s established history in the space flight arena is well known, the Italian-based company are also a major player, famous for hardware such as the ATV (Automated Transfer Vehicle) Cargo Carrier, built for the European Space Agency (ESA). Thales Alenia Space was also a key player in the Columbus laboratory and prime contractor for Node 2, Node 3 and the Cupola – all now on orbit with the ISS. Per L2 mission overview documentation – L2 Link, Antares will launch Cygnus into orbit for five to six days of ORB-D (the name for the COTS demo mission) demos during the period of far field phasing. 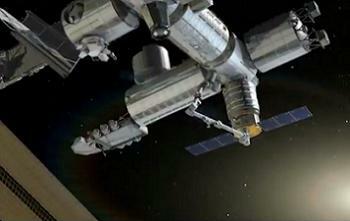 Future missions will only require a standard three days prior to arriving at the ISS. The Cygnus vehicle will be controlled by Orbital at MCC-Dulles, using an ops team that has experience operating GEO satellites, boosted by an increasing number of flight controllers from NASA MOD, who will bring their ISS experience to the table. There will be two key operational phases for the opening part of the mission, the Integrated Launch Operations Phase (ILOPS), for ascent and insertion, handing over to the Phasing Operations Phase (POPS), for the catch up to ISS. As seen with SpaceX’s Dragon mission, one of the main challenges is to safely arrive in the ISS’ back yard, with extra caution required when entering the ISS’ “Keep Out Sphere (KOS)”. Dragon’s only hiccup during its arrival related to the sensors used to allow the spacecraft to “see” the ISS and calculate the distance and closure rates. 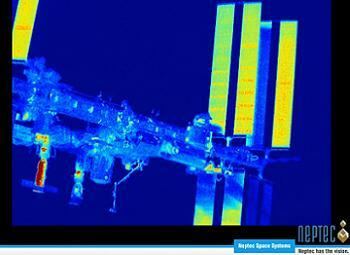 This system is called the Light Detection And Ranging (LIDAR). 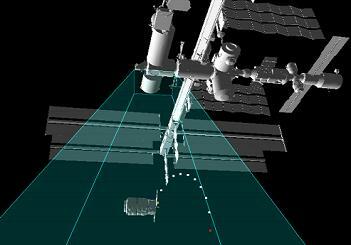 Due to stray light and reflections coming off the ISS, the SpaceX team had to recalibrate – successfully – one of the beams to narrow its field of view. Cygnus will use the TriDAR vision system – designed by Canadian company Neptec, with the support of NASA and the Canadian Space Agency. 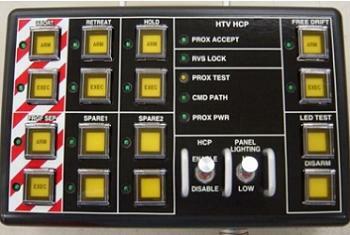 This system provides real-time visual guidance for navigation, rendezvous and docking procedures. The system has proved its worth by flying on three shuttle missions, previously with Discovery on STS-128 and STS-131, prior to the recent trip with Atlantis on STS-135. Its performance with Atlantis during rendezvous was impressive, with the TriDAR-created video of the acquisition of the International Space Station showing how the system tracked the orbital outpost from 34km out, all the way through to Atlantis’ docking. Arguably more impressive was the footage from the undocking and half lap flyaround of the Station, with TriDAR operated in imaging mode. 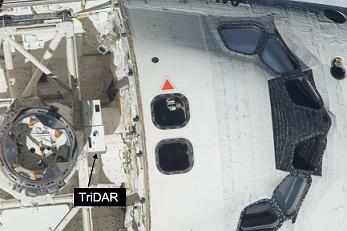 Given real-time tracking of undock and flyaround had already been previously performed during STS-131, the Neptec TriDAR team took the unique opportunity to produce 3D and thermal movies of the last Shuttle based ISS flyaround operation. Neptec noted that the 3D Triangulation and LIDAR Laser Range images were collected simultaneously, utilizing a triangulation subsystem based on OBSS (Orbiter Boom Sensor System) LCS (Laser Camera System) technology. The system worked so well that Commander Chris Ferguson took time during the undocking and flyaround phase to pass on thanks to the TriDAR team. The ISS and Cygnus – as with all visiting vehicles, including Dragon – also need to show they have a strong communication link, required not least for the ability to manually abort the approach – or at least retreat – in the event of problems. This phase of the mission is called the Joint Operations Phase (JOPS). As with Dragon, Cygnus will stalk the ISS, slowly creeping up to its target via a large series of demos to test its systems. 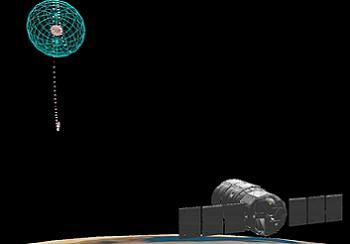 As the Orbital spacecraft sneaks up the R-bar, under the ISS, it will enter the KOS. With its TriDAR locked on – the tenth demo of the approach at this point – a final go will be given for Cygnus to approach to the capture point, mirroring Dragon’s own successful approach last month. The ISS’ Space Station Remote Manipulator System (SSRMS) will then reach out and grapple Cygnus, prior to being berthed on the Station. Once berthed, the ISS crew will begin vestibule ops and Cygnus activation via ISS power jumpers on rendezvous day, documented as a nine hour procedure. Hatch opening and ingress will occur on the following mission day. Cygnus currently supports a berthed duration of up to 30 days, with this period of the mission classed as the Berthed Operations Phase (BOPS). It is not yet known what cargo Cygnus will be manifested with for this demo mission, although a basic sequence for cargo ops has already been written. This involves the crew removing the “top layers” on PORT and STBD pallets to make room in PCM. They will then remove components of the Secondary Structure as required, ahead of emptying the FWD and AFT pallets to gain access to the Standoff pallets, which they will empty and repack. The final phase of the mission – a reverse of the berthing procedures – is called the Descent & Reentry Operations Phase (DROPS), as Cygnus ends its life in a disposal corridor during entry, hopefully with a smile on its face, following a successful demonstration that paved the way for its siblings to each take a turn in providing full CRS operations, starting early in 2013. (Images: via L2’s Cygnus Section – Containing presentations, videos, images, interactive high level updates and more, with additional images via Orbital and Neptec).